What happens when sheer hydropower dares to defy gravity? Fly a jetpack for yourself to find out! Experience the extreme, superhuman sensation that comes with strapping on a real jetpack with this highly-unique phenomenon of flight! Explore the technology and basic operating techniques behind water-powered jetpacks during a ground training of this impressive H2O experience. Then get ready for the wet 'n' wild adventure of a lifetime! Under the careful instruction, supervision and on-going coaching of experienced professionals, first-timers can safely engage in exciting, fundamental maneuvers like take-off, landing, elevation control and steering. 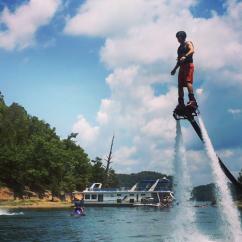 More advanced jetpack enthusiasts are encouraged to experiment with stunts like walking on water, donut turns, dolphin dives, hovering, and hands-free flying. 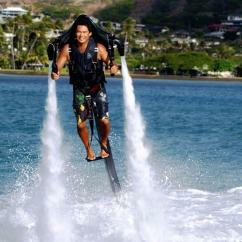 Don't miss the chance to fly a jetpack. There's no better way to make some epic waves and exceptional memories in Newport Beach, Oahu, San Diego, and Las Vegas!